This picture is an urban Parisian scene rather than a rural view, but it is as much a landscape as Constable’s idyllic Suffolk countryside. Instead of the trees we see lampposts which lead the eye into the background. The sky is the roof of the engine shed, the clouds those of steam and smoke from the trains, and the people are reduced to anonymous shapes, without detail. What Monet was trying to do was capture real life in the moment, a style known as “en plein air”. It was inspired by the new art of photography and ‘snapshots’ and made possible by technical advances – portable easels, small pre-stretched canvases and pre-mixed paints in tubes – that meant artists could work anywhere, painting what they saw before them rather than recreating the images in their studios. Although Monet did finish off or rework some of his paintings in his studio, what comes through from his Gare St Lazare series is this immediacy, with a very thick covering of paint and with the brushstrokes clearly visible. Monet did eleven pictures of the Gare St Lazare in all, seven of which were shown in the third Impressionist exhibition of 1877. 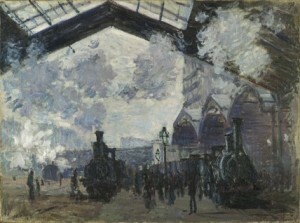 They were regarded as shocking when first exhibited because this – trains, commuters, everyday views – was not the sort of subject matter that ‘proper’ artists painted. The paintings also looked unfinished – there’s no attempt to make them look like perfect images – and compositionally they offended purists – there’s no central focus, the right hand side is framed by the station, but the left is open. In the 1860s and 70s the major showcase for artists was the Salon de Paris. This was the ‘approved’ annual exhibition of art, and paintings were meant to follow a style of carefully finished, precise and realistic images. A group of artists including Monet, Renoir, Cezanne and Sisley grew tired of having their pictures rejected by the salon and held their own exhibition in 1874 as a protest. One critic took the title of one of Monet’s paintings – Impression, Sunrise – and published a satirical review called “exhibition of the impressionists”. The name stuck and “impressionism” became characterised by this attempt to catch a moment in time, where we can see the effects of light on the subjects, and can sense the movement of real life behind the image. The final impressionist exhibition was held in 1886, which was a big influence on Van Gogh, who we will look at shortly. As for Monet, he continued to paint right through until old age – he died in 1926 at the age of 86. Like his Gare St Lazare paintings, he often worked on series of paintings of the same scene to capture the different seasons or different light. These include his series of haystacks, of studies of Rouen cathedral and, most famously, his garden at Giverny just north of Paris. He moved there in 1883 and that’s where he had built lily ponds, the large-scale paintings of which are probably his most famous works. This entry was posted in five minute presentations, National Gallery on 20/07/2015 by donbrown.